Promoting the webinar: Unless you want to play to an empty room, you’ll need to create buzz about your event well in advance of the date. The wrong way: Don’t assume that posting messages on your company’s social media accounts, sending cards in the mail or even cold-calling your customers will be strong enough measures to convince people to tune into your big presentation. Taking these measures can help boost attendance but, on their own, will not be enough to get the job done. The right way: Your attendees need to be invited through email and given official Outlook notifications reminding them of the exact time and date of the event. By committing to register, and by being sent a reminder 15 minutes before the webinar takes place, your attendees are more likely to feel a sense of obligation to attend the webinar when it comes time to do so. Beginning the webinar: A theatre would never lock or obstruct its doors on the evening of a performance; likewise, you’ll need to ensure your attendees can access your webinar platform. The wrong way: Avoid investing in software that needs to be downloaded for attendees to log in. This can cause panic and frustration, especially for those who are presenting. Furthermore, many people are suspicious about downloading software over the Web due to concerns about malware or data usage allowances. 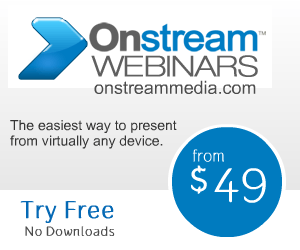 The right way: Make sure that your webinar platform is browser-based so that attendees can access it via an Internet browser. A browser-based webinar platform is hardware-agnostic, meaning that anyone can log in regardless of the make or model of their device. Managing the webinar: Issues related to light or audio quality can ruin a performance at a theatre. Likewise, they can wreck your webinar presentation too. The wrong way: Unfortunately, many webinar platforms make it difficult or impossible to adjust audio and video quality settings once the presentation begins, meaning that attendees must sit through problems like choppy or muted audio or blacked-out video feeds. The right way: Make sure that your browser allows for easy access to video controls so that the moderator can receive feedback from guests and adjust the presentation quality as needed. This will ensure an optimal presentation for everyone in attendance. Following up with attendees: Event promoters in the theatre have easy access to critics’ reviews following a performance. For marketers using a webinar, however, obtaining critical feedback requires following up with targeted leads (i.e., people who signed up and attended the webinar). The wrong way: A simple “thank you” is often all you need to capitalize on an interested attendee following a webinar and drive a sale. But many marketers often drop the ball here and wait to send a thank you note, or don’t send one at all. The right way: Invest in a solution that will allow you to send automated follow-up notes immediately after the culmination of the event. This will ensure that you do not miss the opportunity to connect with audience members while they are still actively interested in the presentation.